The Garmin Monterra is a handheld outdoor GPS device that features a 4 inch multi-touch display. The Monterra features a built-in 8 megapixel camera which will also record video in 1080p HD. The Monterra can be used in ATVs, in boats, handheld or in car. This device also has a 3-axis compass for finding your direction and barometric altimeter to find the precise altitude. You can also measure barometric pressure to predict changes in weather conditions. BirdsEye and Topographical mapping can be added to the Monterra using the SD card slot. Plus you get the latest wireless technology including WiFi, Ant+, Bluetooth and NFC to enable sharing of maps, data and waypoints, etc. Accessories can be viewed here. Garmin Monterra has been discontinued. Accessories are still available for your Monterra click here. Likewise for Monterra maps click here. 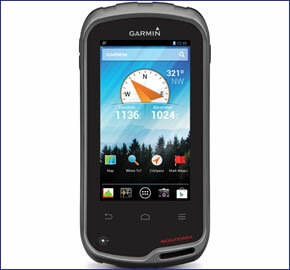 The Garmin Monterra is a handheld outdoor GPS device compatible with Android phone apps and is also Wi-Fi enabled. It features a 4 inch multi-touch display which is dual orientation and sunlight readable. It features an LED backlight which can be used in low light conditions. There is a built-in 8 megapixel autofocus which will also record 1080p HD video. The GPS and GLONASS capabilities of the Monterra allow you to navigate in heavy cover and deep valleys. Preinstalled are maps of recreational maps of Europe. You can also add mapping to the device including BirdsEye Select and Topo maps. There is internal memory and SD card capabilities that allow for 64GB of storage of data such as maps. You can also download Android Apps from Google Play to use on the move in all environments and situations. The Monterra also features a 3-axis compass and an accelerometer and gyro for finding your direction even when not holding the device level. Plus there is also a barometric altimeter that will measure changes in pressure to calculate precise altitude. Barometric pressure can also be calculated to predict changes in weather conditions. There is an in-built UV sensor to measure exposure to sunlight so you can avoid sun damage in high elevations. The Garmin Monterra is equipped with the latest technology to allow sharing of data. It has WiFi, Ant+, Bluetooth and NFC connectivity. This will enable the sharing of maps, waypoints, routes, tracks, geocaches or photos. You can also plan your route before you set off using maps, waypoints, routes and tracks. The maps can be displayed on a computer in either 2D or 3D topoographic maps showing contours and elevations. You can take and store geo-tagged photos or store millions of Points of Interest. Geocaches can be stored with descriptions, hints and logs. You can sort geocaches relative to size, terrain, difficulty and type. Plus you can connect to Garmin chirp found at many geocaches. The Monterra can be used in either All Terrain Vehicles, in boats, handheld or in a car. The battery is optimised for outdoor use and is a dual battery system whereby you can either charge the battery or use AA batteries. The battery life is 22 hours. Do you have a question about the Garmin Monterra or other handheld GPS related question that's not been answered on this webpage? Please see our handheld and Outdoor GPS FAQs page for questions from other customers.Plus if the answer to your question isn't featured, use the online form to ask us for the answer. Alternatively please telephone 01733 777623 Monday to Friday (9:30am-5:00pm) to speak to one of our sales team. Garmin Monterra is preloaded with a worldwide basemap with shaded relief. Please note: Additional maps can be loaded to the Monterra. The Monterra features a SD/microSD Card slot, an easy way to add new maps and mapping updates. Learn more about the different maps that are compatible here. Looking for accessories to use with the Garmin Monterra handheld device? We sell a vast selection of genuine parts and spares including Monterra anti-glare screen protectors, carrying case, automotive suction cup mount, marine mount, Lithium Ion Battery, external GPS antenna and premium heart rate monitor. Garmin Monterra is preloaded with a Worldwide basemap with shaded relief. However, a number of other maps supplied on SD/microSD Card are also compatible including street-level road maps - perfect for cycling of using your Monterra in a car, 1:50k and 1:25k Ordnance Survey maps - ideal for hiking and walking the countryside of Great Britain and marine BlueCharts - ideal if you want to navigate the waters around the UK, Europe or further afield.